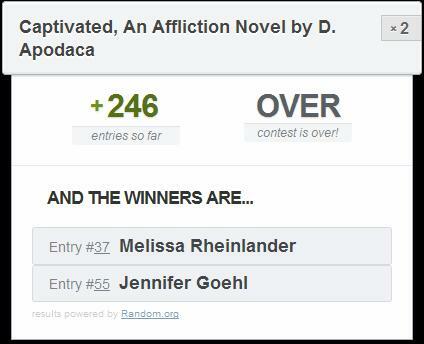 In celebration of the cover reveal of her second novel, D. Apodaca has kindly allowed us to giveaway two eBook versions of Captivated, An Affliction Novel. If you haven't read this book yet, this is your chance! It is AMAZING! 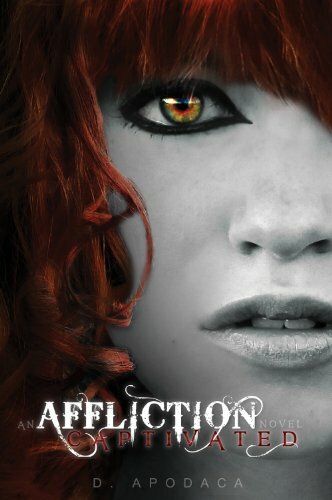 Read my review of Captivated, An Affliction Novel. Mindy Keenan couldn't shake the feeling that somehow...in a matter of moments...the boy she once knew was not the one standing before her. Despite Marcus’ crazy theories about the possibility of Dean not being human. And not to mention the fact that he's dangerous. Mindy can't help that she may be falling in love with him. Even after hiding their feelings for each other from the world. Dean and Mindy being together stirs up dangers that neither of them could ever imagine. When she finds out about what Dean really is and the world he tried to keep her away from...it's already too late. You only have 1 week to enter, so you better get to it!! Thanks for the awesome giveaway! This book sounds really good. I've wanted to read it for awhile now. This cover is gorgeous. I'd have it as artwork. "Despite Marcus’ crazy theories about the possibility of Dean not being human. And not to mention the fact that he's dangerous. Mindy can't help that she may be falling in love with him." Thanks for the giveaway! The whole description sounds great! Don't start the day with broken pieces of yesterday! Loving the way this is set up! :) Can't wait to get the book! "You don't know this yet...But you are mine." Thank you! I really want this book! My fav quote is "..being together stirs up dangers that neither of them could ever imagine" Sounds reaaaaally gooood!! Can't wait to read it! thanks again! This Book looks and sounds really awesome! Awesome giveaway! I've heard great things about this book. "My name is Ashallyn'darkmyr Tallyn, third son of the Unseelie Court...Let it be known--from this day forth, I vow to protect Meghan Chase, daughter of the Summer King, with my sword, my honor, and my life. Her desires are mine. Her wishes are mine. Should even the world stand against her, my blade will be at her side. And should it fail to protect her, let my own existence be forfeit. This I swear, on my honor, my True Name, a(nd my life. From this day on..." His voice went even softer, but I still heard it as though he whispered it into my ear. "I am yours."